Argentinosaur and Giganotosaur were ahead of their time. They were giants, moving across the land, one looking for vegetation, the other for hunks of flesh. Sadly, it took 65 million years before IMAX came around to showcase them in their prime, and wouldn’t you know it, they went and died on us long before that. Jerks. Giants of Patagonia is a cut above Dinosaurs Alive in that while the animation isn’t superb, the scale of it all is better suited for the spectacle it’s trying to be. It still exists more for lavish 3D aerial pans than anything else, the Donald Sutherland narration barren as the score amps up the visuals. The pacing is fine though, the brisk 40-minute production keeping the focus on paleontologist Rodolfo Coria and his hunt for these fossils. 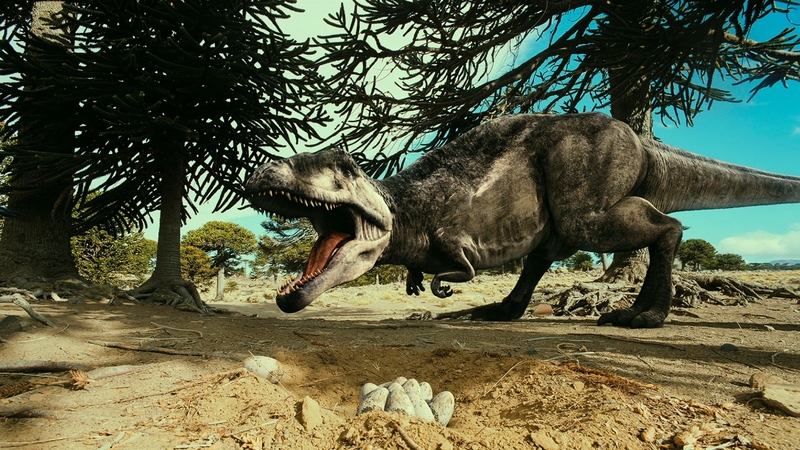 Educational value is high, and kids watching this thing on a 3D display will have a blast as Argentinosaur stomps overhead (or into their face when you think about it). It also tracks the dinosaur’s demise, the theory of increased volcanic activity and eventual asteroid destruction actually quite moving as a baking sun sits in the background of starving herbivores. Released in 2007, Giants isn’t completely up to date, the field of paleontology rapidly evolving. That doesn’t mean the material is worthless as it’s still an engaging means of bringing kids in to learn something about these creatures, this aside from the fact that they eat lawyers and stomp on Jeff Goldblum. Note: This review is based on the 2D version only. DoBlu is not equipped with 3D equipment yet. The large scale IMAX 65mm format means that while this was shot on film, you’ll never see any grain within the frame. It’s too small to even appear, yet the resulting AVC encode struggles with the down conversion. Notably, banding is relentless in the early portion of the film, an early trip underwater containing some of the worst you’ll see, and this is after the first shot on ancient Earth that features the moon, also riddled with compression. Losing the immense resolution of 65mm for 1080p means a variety of problems since this doesn’t look like it was handled correctly. Ringing can surround smaller objects or high-contrast edges. Aerials with complexity (such as a tree-laded surface at 17:20) flicker as the camera pans overheard. Fine texture on the dinosaurs suffer the same problem unless they’re close-up for maximum 3D effect. Contrast looks harsh, at times blowing out the sands of various deserts or the sky. Black levels are fine, if not overwhelming in their purity. Colors are heightened though, particularly the various blues of the water, animated or not. A sunset at 36:20 carries especially vivid oranges and reds. While some of the problems are because of the resolution battle, there’s also the concern of loading a 22GB disc with this much stuff. There are three separate DTS-HD mixes (English, French, Spanish), two versions of the main feature (2D, 3D) and a secondary feature in 1080i as a bonus feature. Even with the short length, that’s simply a lot of content. Giants of Patagonia begins with a warning that it may not be appropriate for kids because it’s “very loud and features very large creatures.” While there’s nothing exactly terrifying about the main feature, the audio offers plenty to be scared about, such as a home theater owners equipment which will get quite the push. This DTS-HD mix begins with the universe before zooming in on the comet headed for Earth which passes with an enormous shock that is only the first of many. Dinosaurs walk with fury and weight, each step hitting with extraordinary low-end impact. It is fully capable of reproducing the material on screen, or at least as we imagine the sound to be like in reality. Fleet-footed dinosaurs wander around the soundfield, the tracking meticulous. Dinosaurs in flight are also brilliantly represented in each channel. Of course, it’s not just the little guys, but the massive ones too. Herds of Argentinosaur wander overhead, footsteps splitting the stereo channels. The best is saved for last though, that of the asteroid actually hitting the ground at 35:50. This is truly an epic moment of bass, the shockwave that results insanely powerful and yes, probably terrifying to any little ones. That’s awesome. The extra is a secondary full feature titled The Lizard King, a jumbled 43-minute piece that is part deleted scenes, part trivia, and part behind-the-scenes. It’s in 1080i and it riddled with interlacing. BD-Live support is also included.